Le Labo is a line that I’ve not paid much attention to, possibly because I’ve heard mixed things about the fragrances but also because the whole idea seems a little ‘gimmicky’ to me. For those of you not familiar with the line, the basic idea is that each fragrance takes it’s name from its main component and its number from the number of ingredients used; so we can assume that Rose 31’s main component is rose (duh) and it contains a total of 31 ingredients. All Le Labo Fragrances are mixed to order at the Le Labo counter and the labels are personalised to include details such as the customer’s name and the store it was mixed in. 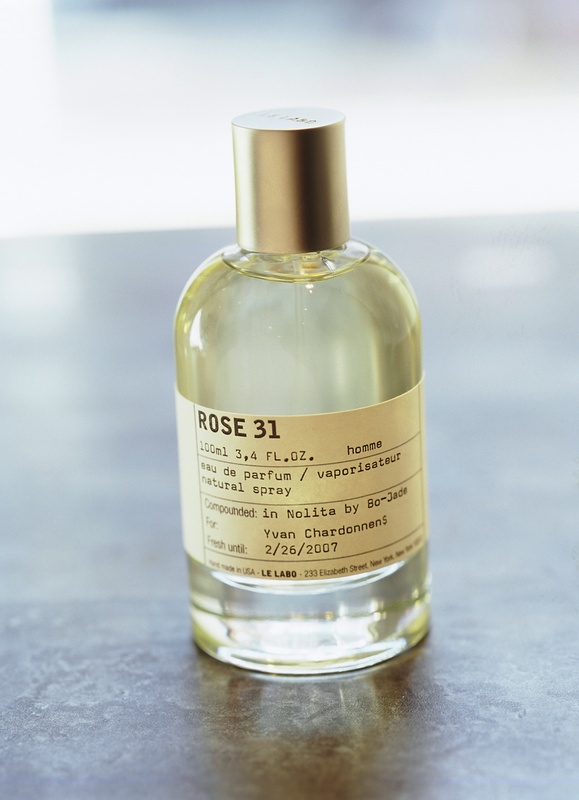 Rose 31 is marketed as a masculine and seems to be one of the most popular Le Labo fragrances, now that I have my hands on a bottle It seems a good opportunity to see what all of the fuss is about. There seems to be a lot of mixed feelings about Rose 31, some people believe that it’s not a rose fragrance at all, others disagree. To me, Rose 31 is most definitely a rose fragrance, sure may not be a blatant rose in the same vein as fragrances such as Nahéma by Guerlain but it is a rose none the less. Rose 31 has a very complex opening, there is a lot going on! The rose is very prominent in the top notes, it’s sweet and slightly powdery. Along with the rose there is a huge amount of spice, I smell ginger, cardamon and a lot of cumin. Now, when I say ‘a lot of cumin’ I don’t mean anything like the amount used in Kingdom by Alexander McQueen which is famed for it’s overdose of cumin, in Rose 31 the cumin is used at a much more tolerable level and it blends really well with the rose and the other spices. Despite there being a lot going on in the top notes, Rose 31 never feels over the top or messy, it’s pretty well blended. After the spices subdue the oud really comes through in all it’s sour, medicinal glory. What I like about the use of oud here is that this fragrance is not oud-centric so it’s used with a very subtle touch and is allowed to just compliment the rose and the spices. Luca Turin described Rose 31 as ‘carrot juice’ in The Guide and as much as I respect his opinion (c’mon he’s Luca Turin!!) I have to disagree, there is nothing ‘carroty’ about this fragrance, it’s warm & spicy and I would go as far as saying it’s a little bit edgy. The top and heart notes are absolutely fab but as you may have guessed by the title of this review the dry down is where Rose 31 disappoints. I feel that it’s probably worth mentioning that I’m not a big fan of cedar wood, I find it to be too dry and harsh in a lot of fragrances and the only cedar fragrance I enjoy is Féminité du Bois. In Rose 31 the cedar is especially harsh and dry, it doesn’t work with the oud and the overall effect of the dry down is quite jarring. It’s a big shame that the dry down is such a disappointment because I really enjoy the first few hours of Rose 31, it is after all a very interesting take on a spicy rose. I like it enough to own a bottle (through a trade not a purchase) and I solve my dislike for the dry down by reapplying the scent regularly throughout the day thus avoiding the dry down completely. Rose 31 is marketed as a masculine fragrance but I do think it would work really nicely as a feminine (my mantra with all fragrances is ‘wear what smells good’ so this is no surprise). If you’re looking for an interesting spicy rose and you LOVE cedar then Rose 31 is absolutely worth a try. Rose 31 is available in made-to-order 50ml (£90) and 100ml (£132) Eau de Parfum. The Le Labo line is exclusive to Liberty in the UK and fragrances can be purchased in store or online. This review is based on a bottle of Rose 31 from my own collection. Posted in Floral, Le Labo, Masculine, Perfume Reviews, Woody and tagged 2006 Release, Le Labo, Masculine, Oud, Rose, Rose 31, Spicy, Woody. Bookmark the permalink. I was pleasantly surprised by Rose 31 and I’d quite like to explore the line further, the Patchouli especially sounds interesting. I ❤ les carottes sounds fab, I shall have to seek it out! I , like you, try to avoid marketing antics and general statements about a house and actually try their offerings. I really like Rose 31, Patchouli 24 and Santal 33. I see the the former twoas staples to my wardrobe. I love the longevity and sillage on rose 31. I’m glad to hear that you enjoy others in the line, Patchouli 24 and Santal 33 do sound like they are definitely worth a try. I have this one and what I can tell you is that there is a lot on variation in the way it performs depending on who wears it. On me for instance the rose is not so strong (definitely a rose scent though) but it also develops into a heart that has a strange bodily warmth. If you have tried their Oud 27 you will know what I mean. It feels like smelling a living creature. A clean armpit or a warm breath. It is really hard to describe this effect but it seems that the people over at Le Labo have mastered this effect. Patchouli 24 is fantastic but don’t expect a lot of patchouli there. It is mostly tar and peppery vanilla. Nothing like it out there. Perhaps it’s the cumin that gives it the body warmth? I have tried Oud 27 in passing, I remember it being very animalic and almost like sniffing a barnyard, it’s definitely on my list to try. You make Patchouli 24 sound so good! I don’t think it is just the cumin. I am sure there is some sort of aromachemical in there that creates this illusion of the fragrance being in 37 C, just like a breath. Hmmm…I get the body warmth but I think I’m missing the breath-like note. It is more present in Patchouli 24 and Oud 27? Actually the opening of Oud 27 is all about this breath note. It is a mix between halitosis and smelling a cat’s fur. Then it softens in one of the most beautiful woody, masculine scents with a late 70’s vibe. Patchouli 24 is more conventional in its texture. Bitter tar and sweet vanilla fight for your nostrils. I just picked up my first Le Labo (I went to their boutique off Marylebone) because after going there for a day and wearing various scents all over my pulse points I fell for Poivre 23. It’s supposed to be Bourbon peppers (and I honestly have no idea what that smells like) but to me it smells very salty and I hated it at first but over the day the more I wore it I just fell in love with it. Of course, being the “London” scent it’s twice as expensive so I had to save for ages to pick it up. I’m quite glad I did though, I enjoy smelling salty! I’ve heard very good things about Poivre 23 but the price is obscene. Did you get to try any of there others whilst you were? Did you try Rose 31? I did. I spent an entire day with Santal 33, Poivire 23 and Rose 31 on 3 different pulse points and sniffed each repeatedly throughout the day (as the nice thing about the Le Labo shop is they let you smell them all, then have you try on your favourites and then send you away to come back again when you have decided which ones smell the best against your skin [since it’s such an individual thing]). I really liked the initial spray of Santal 33 (who doesn’t love the smell of leather!?) and the Rose 31 was a bit iffy but I found I really didn’t like the dry down of either and as time progressed the dry down of Poivre 23 was just so appealing. As I saved up for Poivre 23 I found myself going to Liberty on a weekly basis just to spray it on myself to try and convince myself I didn’t need it (but really I just became more obsessed – I was pretty convinced they were going to ban me for being the crazy Poivre 23 spritzing lady!). The nice thing about the Marylebone shop is you can buy it in 15mL and it only costs £70? Or thereabouts. You can only get that size there and if you are trying to make a decision….it’s good for that. I had to save for two paycheques to be able to fund this scent (and the rest of my life [the fun and not fun stuff])…but I’m really glad I did. It sounds like Poivre 23 is the one for you! It’s great that you’ve found a scent that you love so much. Your new nickname has to be ‘The Crazy Poivre 23 Spritzing Lady’.